The authors of the canonization acts and the editors of Birgitta’s revelations often used the topos of a “hostile witness,” someone who experienced a conversion and became one of Birgitta’s fervent devotees in the same way as Apostle Paul had in the New Testament. The testimony of a former enemy is one of the most convincing when it comes to persuading the reader.1 The stories about the critics and their conversions strengthened Birgitta’s authority. They were proof that her visions were authentic and her message should be taken seriously. 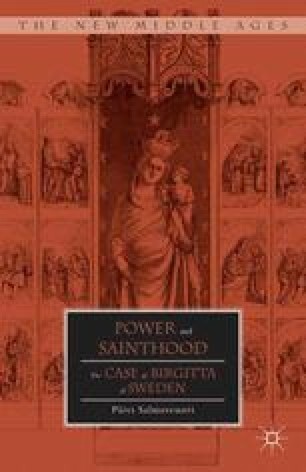 In the canonization acts they also showed Birgitta’s proven and tested sanctity, and, thus, the strength of her character. The sources show this strategy usually worked well both in the 1340s and after Birgitta’s death. I am especially interested in examining more closely how Birgitta reacted in those situations and how she exercised power. Therefore, I seek to find out, among the hagiographic emphases, what could be known about how Birgitta acted and reacted during the actual situations. I start with the resistance Birgitta met at Alvastra.